One of the handiest tools we use is the nail set. I mean how ugly would our trim look with nails sticking out, or even worst, trim with hammer dents? So now that we have established how great they are, how can they be made better? Bostitch came up with a simple solution that improves upon the classic design, and does so without breaking the bank. Their new 58-500 nail set doesn't appear to be any different at first glance. It is only when you take a closer look that you notice it is in fact two nail sets in one. They have taken a cue from the handy reversible screwdriver and applied the same concept to their nail set. On one side of the double-ended insert is a 1/32-inch nail set and on the reverse side is a 1/16-inch nail set. The nail set insert is held in place with a 1/4-inch chuck similar to those found on quick-change drills. This makes flipping the set quick, but also allows users to use the nail set as a handle for screwdriver bits in a pinch. 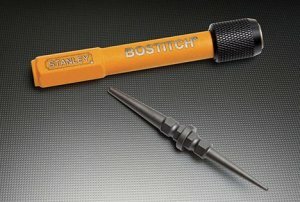 The Bostitch 58-500 is priced at under $10. You can also find this same nail set branded by Stanley as the 58-501.